One of the best things about being a resto druid – other than tree form, awesome hots, and the general coolness of it all – is the rest of the blogosphere of resto druids. 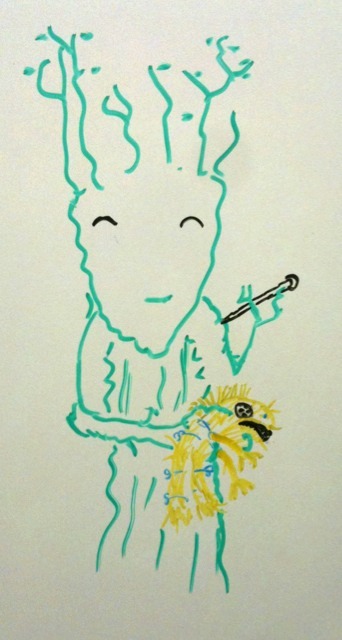 Seriously some of the best, most talented bloggers out there are resto druids. Resto druiding in Cataclysm in general? Start with Lissana (Currently aimed at level 80s in 4.0.3a, she’ll update to 85 shortly) or her Cata Leveling Guide if you want to level in your offspec (because tree punches don’t always cut it). Keeva’s Guide will be around soon and will be well worth the wait, believe me. Bookmark it now if you haven’t. What professions you should think about? Keeva’s got you covered. Healing in general? Lissana’s always a good place to start. A very insightful post from Cannot Be Tamed compares heals across all 5 Healing specs – highly recommended reading, just to really understand your partners in heals, if nothing else. And, to toot my own horn, my old posts on Triage and staying calm are more relevant now than when I first wrote them. And Reversion post about understanding the “shape” of a fight’s damage, while designed for tanks, has a lot that healers should know, too. So, yeah. All those links are written by people with resto druid main or off specs. What can I say? Clearly the true spec for bloggers must be Tree. After all, we all communicate electronically, saving lots of paper, and hence, trees. First stanza of Kipling’s famous poem should probably be on a sticky note on every healer’s monitor. I’m not saying that the other roles in the game don’t require laser like focus and attention to detail, but I know I personally have to be totally in the groove every GCD to heal at the top of my game. On my mage? Hit Arcane Blast a billion times, pop cooldowns when they’re available, don’t stand in fire. On my druid? Watch for who needs a heal, who needs an emergency cooldown, who is about to take damage and should be Rejuv’d … and still stay out of the fire. More than that, I don’t know if it’s a me thing or a healer thing but if I’m healing the raid and we wipe, I feel guilty. Really guilty. Like “that was all my fault if only I’d been a better healer that wouldn’t have happened.” I don’t feel nearly as bad tanking, and dps? Psssh, not my fault. I did my job. But when I’m healing, I feel like I ought to be doing everyone else’s, too. And what about when people are saying it’s your fault? Do you just let them, or get defensive, or even say “yeah, it was me”? Like the poem says – you have to trust yourself, but if everyone is saying it’s your fault, you have to look at yourself and make sure that’s not true. Not trusting yourself will lead to wipes. So will not trusting your partners – the other healers, the tanks, the dps. A druid throwing Nourish on a tank when she should be trusting her Disco priest buddy can wipe the raid easily – or save the day if the priest got distracted. What do you do? So: some specific strategies that I use. What do you use? I’m always looking for new tips. Keep a Cool Head – learn to accept and react to a situation rather than panic. Important when you’re out of mana and the tank just aggroed two more pats. If you panic, you die. If you can quickly prioritize your problems and do things in the right order, you live. Slap a shield or an instant HOT on the tank, blow your “get mana back” cooldown, drop a big cooldown on the tank to get him back up, and play triage. Zen and the Art of Raid Maintenance – watch the raid like a mama bird watches her stupid, half-blind, flightless chicks. They’re going to try to fall out of the nest, choke themselves on half-eaten worms, and go play with that friendly hawk perched at the top of the tree. Don’t let ’em, but don’t get mad at them when they do. Heal through the stupid because you can. Screw it, I don’t care if the mage dies – the opposite of the above. After the nth time that warlock life taps right before combat or the mage runs away from the tank in order to frost nova mobs right by you – they’re too stupid to live. Think of it as evolution in action. Let them die that others may live. Mentally pretend their health bar is already gone, stop wasting mana on them, and concentrate on the tank and the ones who aren’t being stupid. It’s easy enough to discuss strategies like this but implementing them is something else entirely. For that, I practice in 5 mans. Deliberately keep your mana low so you can learn to assess priorities and how to regain mana fast when you need to. Let a warlock die (it’s good for their souls anyway). Think two steps ahead of your party members and have them shielded or hotted before they take damage. The most challenging situation I think a healer can be in, as far as state of mind goes, is the pug raid healing job, where you don’t know what you’re going to get. Often you won’t know anyone, or many, in the raid. The leader may or may not know anything about healing. Your healing team may not be optimal and probably hasn’t worked together. You can make one of two fatal mindset errors here: you can decide it’s all up to you, or you can decide it’s all up to them. In fact it’s neither. You are not responsible for the success of the raid as a whole, but you are responsible for doing your part. One thing I’ve often found in pug raids is that the leader will give some vague directions like “druid heal ranged shammy heal melee pally on tanks”. Ok… but how do you easily tell ranged from melee? Nobody sorts groups these days… Well, I have Vuhdo set to show “class colors” as the health bar for each person in the raid. 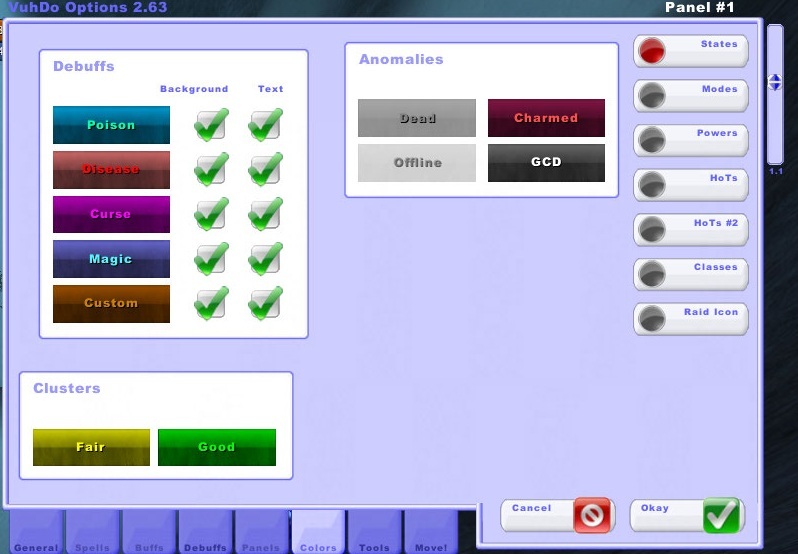 So mages are light blue, paladins are pink, etc. I can instantly tell class by looking at my Vuhdo setup. Makes following that sort of vague instruction easier. I’ll whisper other people on the healing team and ask relevant questions. If I’m on my paladin and there’s another holy pally, I’ll ask “Who are you Beaconing?” and then Beacon the other tank. If there’s another druid, I’ll set up Rejuv priorities (“You do groups 2 and 3, I’ll do 4 and 5, both of us do tanks”). Anyway, those are my strategies. Anyone have any they can share? And if all else fails, and your concentration goes to hell and you lose it entirely – well, the run back from the graveyard is a perfect time to practice your deep breathing and work on your patience. Well he started asking in guild and lo and behold, a number of raiders had tertiary alts they wanted to get some badges on. Before we knew it, we had 9 of 10 slots filled. All we were missing was a second healer. Nobody in guild volunteered so we decided to pug it. We get in, start clearing trash. The guild clears trash faster and more aggressively than any pug I’ve been in, so it keeps you on your toes healing and today seemed especially bad. I thought it was just because the other tank wasn’t turning the Servants of the Throne around. I keep an eye on the priest’s mana bar; with only 4800 gearscore, his mana regen might be weak and I’d need to toss him an innervate. It didn’t get very low though, and I kept having a hard time healing. When a pair of frost giants appeared, we wiped – more or less; I managed to escape but almost everyone was dead. I started looking at the healing meter. And something was very, very wrong. I was at the top, as I expected – with 70% of healing done. After that the pugged priest was at 15%. The shadow priest was at almost 12% just from Vampiric Embrace! This didn’t seem right. Well, maybe he was using a lot of bubbles and it wasn’t showing up right on the meters. He was holy, not disc, but who knows. I told Vuhdo to display for me the Power Word: Shield and Weakened Soul debuff on raid members. Oh, there was – one shield, briefly, on one tank. And thirty seconds later, another – on himself. No, I was starting to suspect our problem lay with the healer. I started giving him specific instructions via whisper, fight to fight – “Ok, you keep [off tank] alive”, knowing Reversion and I could coordinate his cooldowns and my Oh Crap moves and be fine. It worked, more or less, but the numbers on the meters were staying where they had been and I was working harder than ever to keep everyone alive. We got to Saurfang, killed him. Fortunately the Mark went onto one of the tanks, something I find is a lifesaver when the healing is underpowered. Better to have all the heals going to one person than split among three. Saurfang dropped the healing staff, Mag’hari Chieftain’s Staff. I’ve got that; I use it sometimes. The pug healer and a couple dps rolled on it. Reversion asks in the raid whether it’s main spec for the healer – who had lost the roll. No reply. So he gave it to the winner of the roll. We go into the Upper Spire. Pug healer dies in the mist, releases. I charge merrily along healing as we pull trash. All of a sudden we notice something is very, very wrong. Well first, it’s been a good five minutes and there’s no sign of Pug Healer. Second, the tanks now have only 50k health. It sinks in as we look at our buffs. The Strength of Wrynn – our 20% boost – is gone. Suspicion immediately falls to the pugged healer. “Did you talk to the king?” we ask him. No response. The raid decides we’ll leave the instance, wait half an hour, and hope the buff comes back. We remove the pug healer and troop outside. There were two schools of thought on this; some thought he was just so stupid he managed to remove the buff from us while trying to get upstairs. I thought he might have done it on purpose because we didn’t give him the staff. Either way, we weren’t playing with him again. Half an hour later, the buff is back. Slowly we re-form the raid. This time, a guildie volunteers to heal – a holy paladin! Huzzah! We end up pugging in a rogue for some dps since one of the earlier group had to call it a night, and we set off to kill some abominations. Boom boom boom – and a surprise for me, the Plague Wing achievement. Apparently Analogue had only downed the Professor on 25 man. Turns out it was my paladin who had done it on ten man. Heh! It’s always funny when you get an achievement for a fight you know pretty well. We were getting tired, and sloppy, but we went to the Blood wing and I got another first, this time a real first: Blood Princes and the Queen. I’d seen the Princes but only to wipe; Reversion had finished Blood Wing previously, so now I’m caught up. My personal progression in ICC is 10/12! The evening ended on a lower note when we wiped twice to Dreamwalker; I was tired and just couldn’t keep the raid alive while the paladin was inside. But the second two wings were way easier than the first, because I had an actual healing partner and not a parasite. So all in all a very good raiding weekend. Stay tuned tomorrow; SAN is going to finish up BWL and I can’t wait. 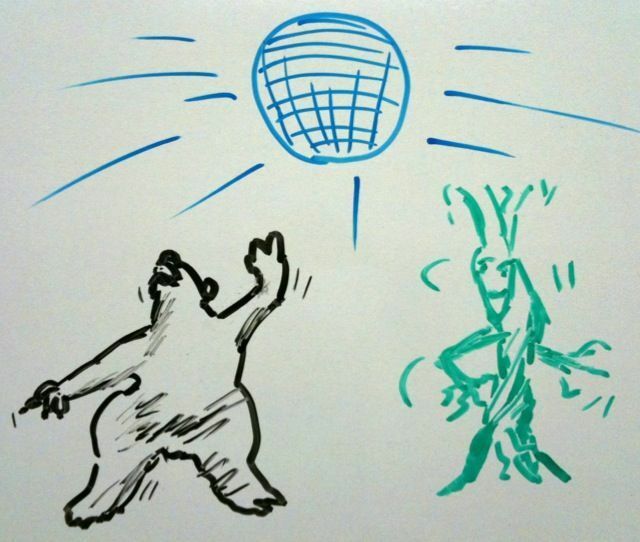 Instances are a dance. They are a dance of destruction and death and hopefully a dance of life and success. The tank leads. Leading is not about going at your own pace, it is about setting a pace your partners can keep up with. You don’t set the pace too slow or your partners get bored and either leaves or tries to lead. If your partners are more accomplished dancers you may have to push yourself hard to keep up with them while still leading. The tank may even have to lean on them a bit or ask one of them to lead for short periods of time. Leading in a dance does not mean you are in control. It means you make the first move and you signal as much as you can to your partner so she can keep up. Ignoring your partner almost totally only works when you know they for certain can keep up. When you do know they know the tune and the steps then you can cut loose. But if not, you will quickly find yourself dancing alone. A good tank is a good dance partner no matter who his partner is. Fast, slow, waltzing or break dancing a good tank knows them all. Leading also means finding out how NOT to step on the toes of your partner. It also means being polite when your partner steps on yours… but not too polite unless you like sore toes. The DPS and heals all follow. Following means reading your partner’s moves and matching, echoing or merely complimenting them. It also means pusing yourself when they are challenging you to keep up. If the lead partner is good they will set a pace you can handle even if it is a whirlwind. You might surprise yourself as you stretch to keep up. You might get burned if they prove to be a poor lead, but you will never know unless you step out and allow them to toss you in the air every now and then. It might be a frightening at first but better to embrace the challenge than to refuse to be led. This analogy shows how BOTH sides have to adapt. You might have to read their intentions and follow. The lead has to communicate those intentions and be sure all partners can keep up. The dance is never more smooth than when you partner with someone that really knows you and your style. My best partner is my wife. I have run with some great healers that were able to keep up, but when it comes to knowing my rhythm she is best. It certainly helps that she has crazy uber healing gear. However, even uber gear will not keep me alive when I pop cat form and dash two groups ahead and start AOEing the crud out of 4 packs at once. In some ways though, a very good and very familiar partner will make us complacent. We stop trying to read every move and just fall on familiar patterns. An unfamiliar partner forces us to read and learn as we go. Most of all we cannot refuse to dance. If our partner for a swing-dance drops and starts spinning around on their head we must be at lead willing to shrug and follow along as best we can. If you refuse to dance to all except one sort of music you will find yourself unhappy and short of partners. But when it comes to pugs don’t assume you will know the tune, the song, or even get a flat dance floor. 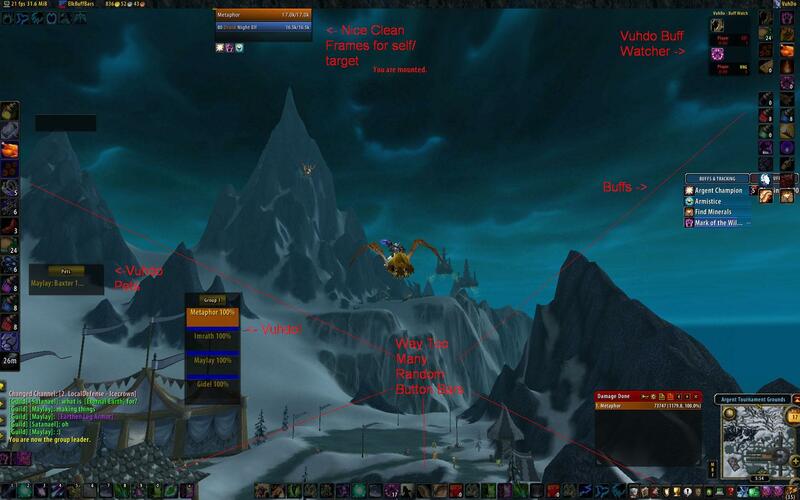 Profiling Tanking and Healing; the ‘shape’ of the fight. I started writing a post about multi pulls, the fine art of doing ‘gogogo’ tanking the right way. As I started the post I realized I should do a whole separate introductory one just covering this concept. I realized this concept was so critical to both tanking and healing that I decided to tag it to both our series. What I am about to talk about any good healer knows by gut feel or by detailed mental charts and graphs. 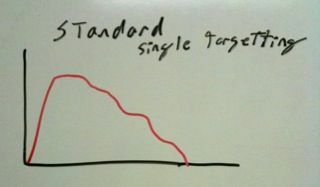 I figure adding more charts and graphs will help us all understand it better. 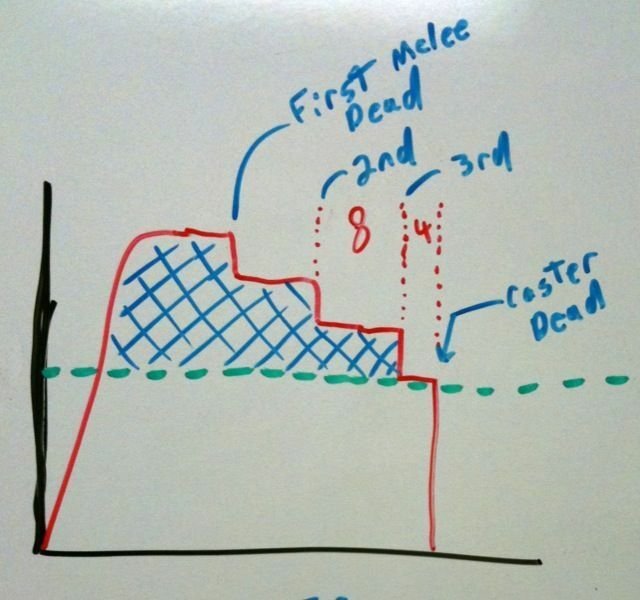 Here is the concept: The rate of incoming damage is key to surviving a fight. This first one is a standard fight. We round up 4 monsters and kill them one after another. 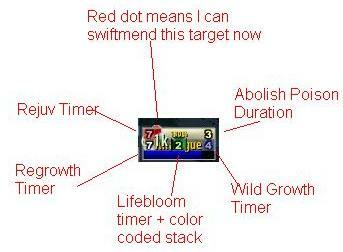 The red line represents how much damage the tank is taking at each moment in time higher means more damage. 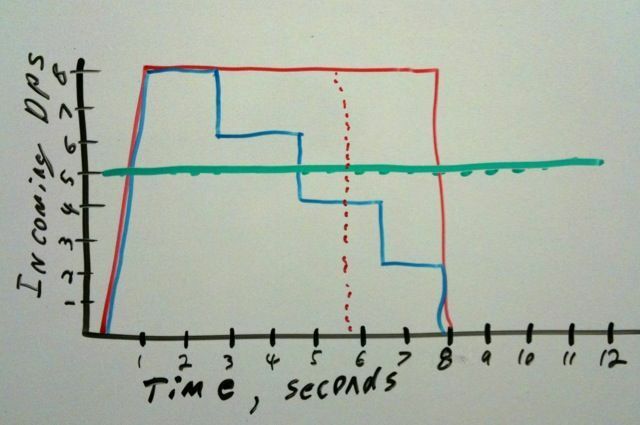 Time is the bottom scale of the chart so the start of the fight is where the two black lines come together. Time processes to the right. Notice the damage ramps up fast as the fight starts. Notice that after each critter dies the level of incoming damage drops until the fight is over. Now to compare here is a fight were everyone using AOEs hard. The incoming damage stays high longer but then drops to nothing as all the critters die at the same moment. Because all the creatures are taking damage at the same time they all die at the same time. But until they all die the damage level the tank is receiving does not change. 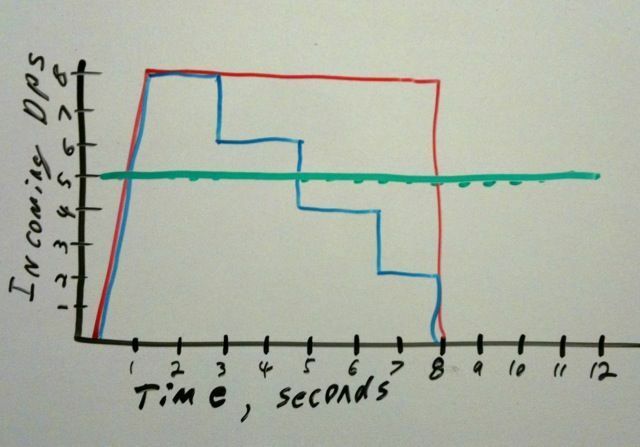 Now I am going to add heals per second to the graph. As a healer knows the ‘heals per second’ are not constant and actually spike up and down depending on what you are casting. But, on average there is a maximum rate. All of us healers know that at some point there is simply more damage coming in than we can keep up with. Tanks know when this happens if they look at the health bar. If the bar is going down and does not go back up then they are not getting as much HpS and the incoming DpS. Here are some heals. The green is the healer’s healing per second. Notice it ramps up and levels off at a maximum level. Up until the second creature dies we are actually not healing all the incoming damage. Any healer has seen this happen. It is usually when we are under geared but it can also happen when adds show up. We are frantically spamming our stuff but the party is still going down, then suddenly one or two of the enemies die and the damage stabilizes. A moment or two later the damage levels drop more and our heals start bringing everyone back up to full health. So what does this all mean. Well first off it means that a healer does NOT have to be able to heal the full incoming damage of a particular fight to healer it. As the DPS increases it actually means a healer can heal runs that he/she does not actually have the gear or healing ability to handle. The DPS and tank are carrying the healer. Usually no one but the healer knows. And not one actually cares because unlike a DPS or tank getting ‘carried’ the run is not actually slowed down. At least not from heal rate. What comes into play after this is mana pool. At some point the healer runs out of mana. There are two ways for the fight to go badly due to not enough DPS. One is when the creatures to not die before tank health drops to zero. You can’t have the incoming damage be higher than the heals for very long. Every moment incoming damage is higher than the heals health bars are dropping. The second way is when the healer goes OOM. This is also a way to get a wipe due to a fight that is too long. But that first threshold is the critical one. An under-geared healer either needs a good tank and hard hitting DPS or the party goes down. This is the point where a smart party starts using extra tricks like CC to lessen the rate of incoming damage. There are other ways to lessen the damage and extend what you can do with a given party. For example targeting one hard hitting mob first. This is why smart groups primary casters. 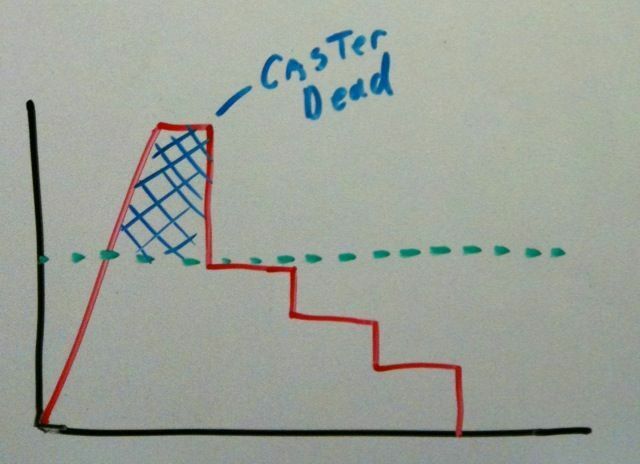 The casters are usually softer targets that hit extra hard. 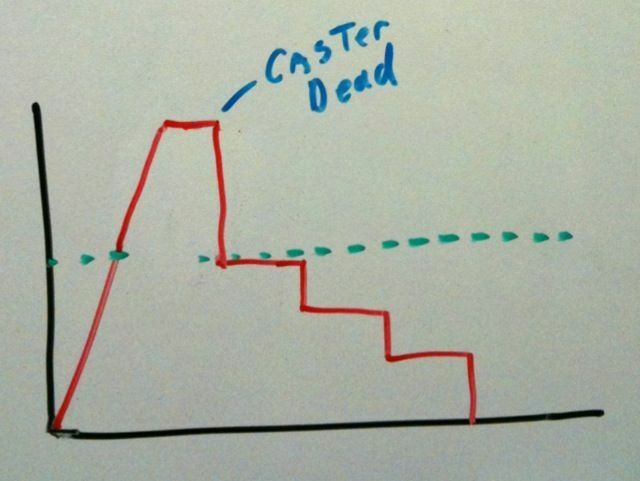 So killing a caster is a great way to drop that incoming damage fast. 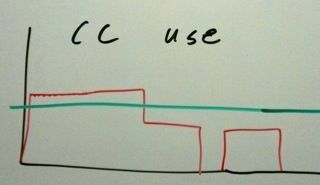 For kicks let’s put that on some graphs. First off we see the party killing 3 melee enemies and one caster. They start with the melee. 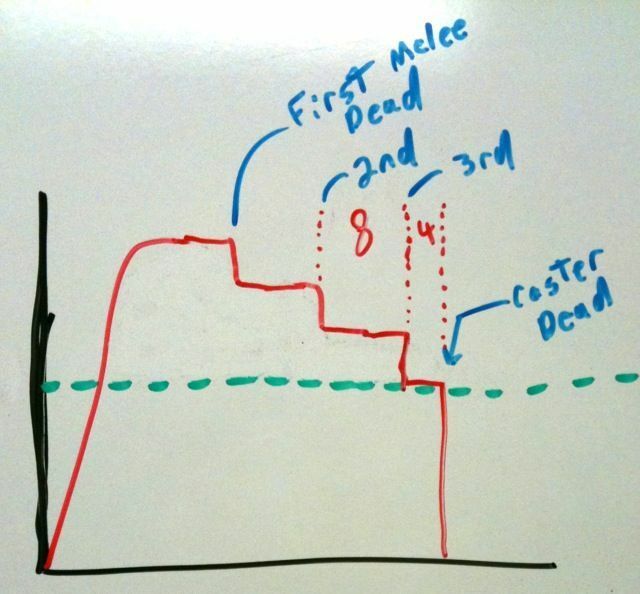 Each melee takes 8 seconds to kill and when they die they remove a small chunk of incoming DPS. Finally the caster only takes 4 seconds to kill and removes all a lot of dps, ending the fight. Now look again when the kill the caster first. Notice the green healing line? See how we get under that line much sooner? Also notice that the entire fight took the SAME length of time! Why does this matter? It matters because this is why many DPS will not understand WHY they need to go after soft high dps targets first. All they see is the fight taking the same time either way. If the healer can’t keep up that is the healers fault, right? See all that blue area? That is how many hit points the tanks’s HP bar went down. Everything below the green lie got healed back up again. Everything above it caused his bar to go down and stay down. Now try the other way of doing the fight. See how much less damage the tank takes? What if the tank’s total health is only 80% as big as that first chart. Everyone say ‘hi’ to the spirit healer when you see her. You have a party where your healer heals that much less than the maximum output of a pack and the tank’s health is smaller than that big area then you HAVE to do other tactics to survive. At this point jerk dps will say “yeah but it is totally the tank and heals fault we died.” Wrong, it is everyone’s fault. The tank for not having better gear, or popping cooldowns, the DPS for not stunning targets, trapping targets or otherwise lessening the incoming damage, the DPS for not following a smart kill order and finally the healer for just being inadequate at healing. Some while it is everyone at fault in various ways there are a lot of things that can be done to make this party work. Sadly most of the time one or more of the party is too busy blaming someone else for the issue. Of course there are lots of other factors that can make a group into a fail group. Kill order is just one of them. 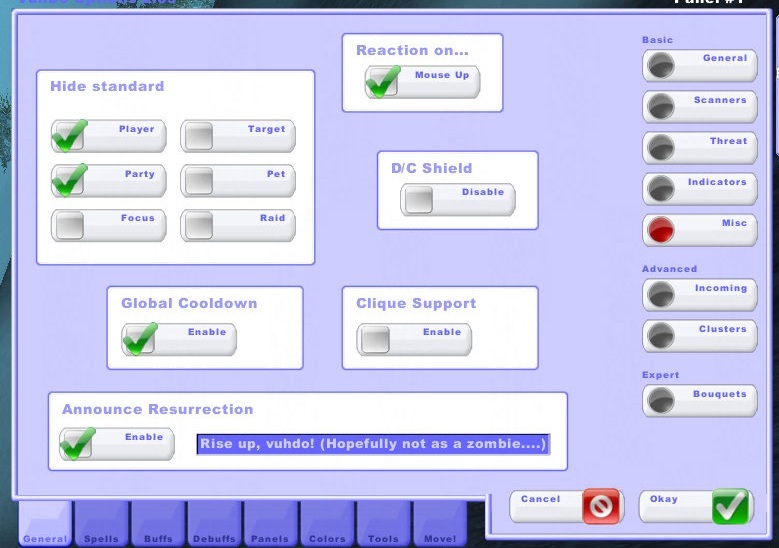 Hopefull this helped show how what order the DPS kill things in can cause the tank to live or die. Before I go let’s look at one more. Here a chart of two parties doing the same fight two different ways. One is the red line and one is the blue. The red group was the FAIL team and they decided to each target a different critter in pack of 4. Each critter was doing 2K dps to the tank. Because all the dps (and the tanks DPS) was evenly balanced everyone in the group dropped their target at the same time. It took them each 8 seconds. 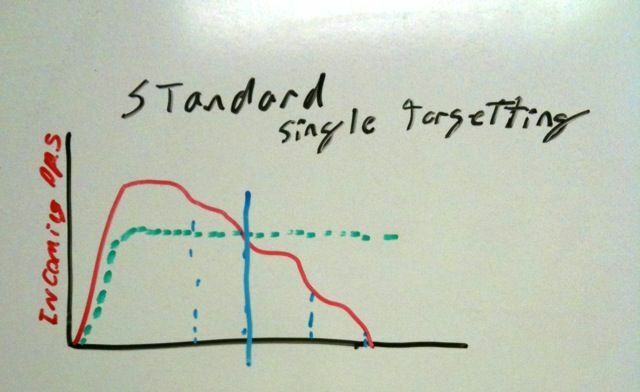 Now observe the blue line. 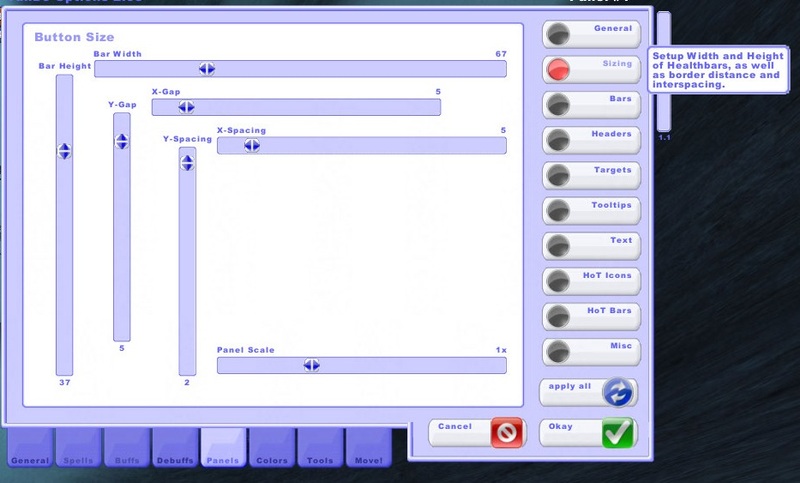 This group had the same damage output but instead the concentrated all on the same target. Because 4 people did 4 times as much damage as 1 person it only took them ¼ the time to kill each target. So each target dies in 2 seconds. Notice that this means the damage start dropping very early. If both groups had a healer that could only heal 5k per second which tank is in trouble? The blue tank took 3k unhealed damage for 2 seconds and 1 K unhealed damage for 2 seconds for a total of 8K unhealed damage. No problem! The red tank took 3K unhealed damage for 8 seconds. This is a total of 24k damage that did not get healed. Ouch! Let’s say we have a poorly geared tank that only had 20K HP. Who is at fault? The tank for being weak, the heals for being weak or the DPS for completely failing to pick targets that anyone else was on. Now lets say that instead of soloing targets they all threw AOEs. 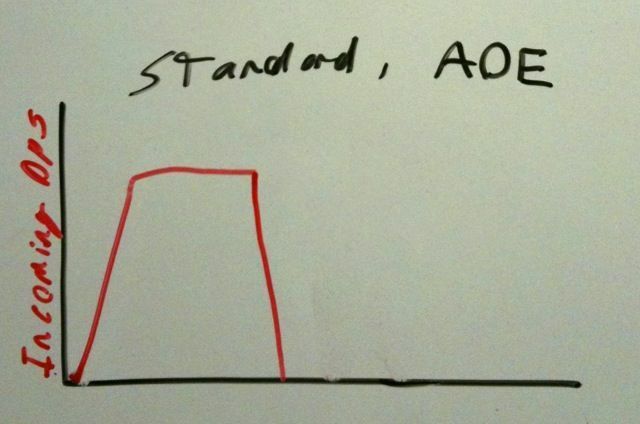 The dashed red line is the end of the fight using AOEs. This time the fight ended faster than the ‘good kill order’ blue group but the tank STILL took more damage. I am not using real numbers because I am not a min-maxer or any sort of real theory crafter. The point of all this is to give a ‘feel’ for why various tactics work better. Hopefully the illustrations were useful. Before I go here are a couple more. 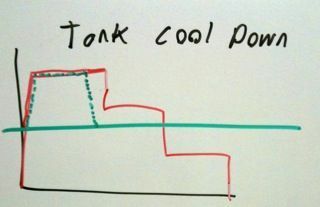 In this one the tank popped damage mitigation cooldowns at the start of the fight. 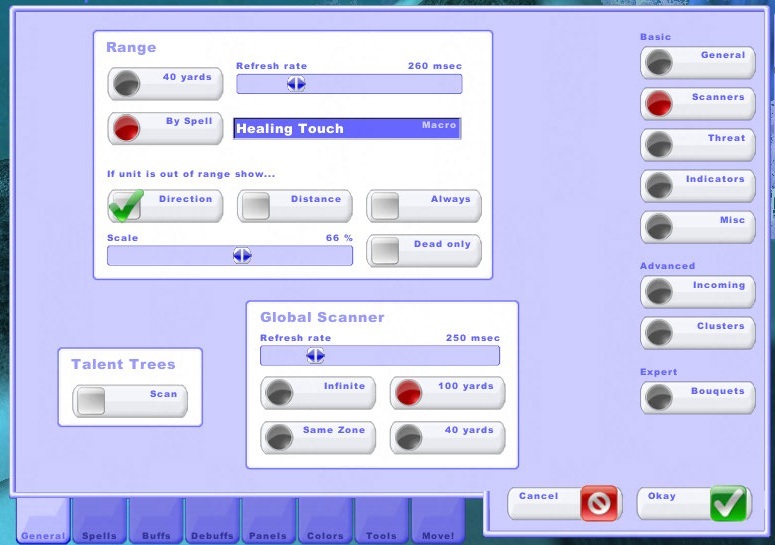 See how they added a buffer of ‘virtual heals’ which helped the healer through the critical phase? Here is that same fight with one critter getting sheeped. Notice how much it helps? I hope to do more with these concepts in the future. 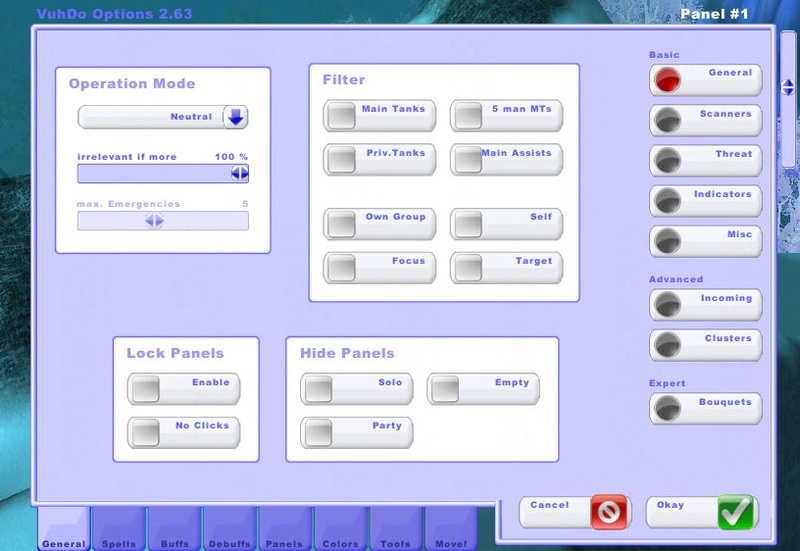 They will be useful for understanding tactical use of cooldowns and also the best way to do ‘multi-pulls’. The point of this post was to get people thinking about and using the concepts of ‘rate of incoming damage’ and ‘heals per second’. You don’t have to be a min-maxer or math wiz to have a working knowledge of these concepts. They are useful for having a ‘gut feel’ about what went wrong in a fight or what needs to be different. They are pretty simple concepts but they have effects all over. Finally I will throw a couple out there and not explain them. Here are two different healers using different mana conservation strategies. But that is a topic for some other day. 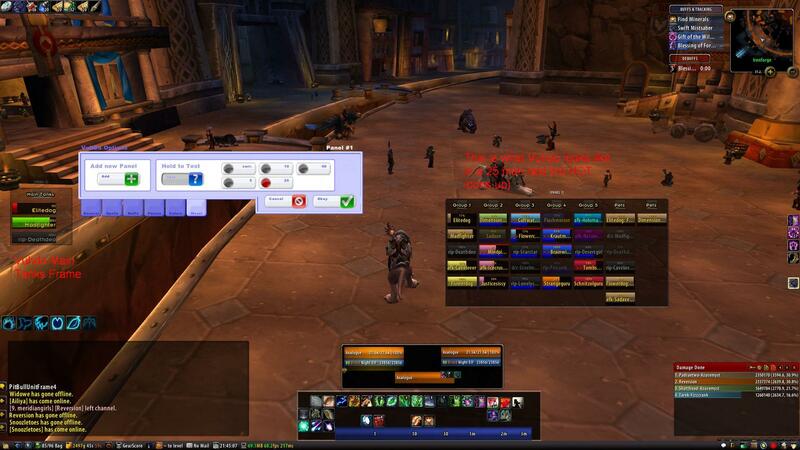 As a healer, your game ui can be your greatest assistant or your worse enemy. Yes, even worse than that dk who seems to think fire gives him an attack bonus. Probably it ups his spellpower. As I’ve mentioned before it’s important not to get tunnel vision when you’re healing, and your ui can help – or hurt – with that. Here’s a screenshot from when I was 65. A lot has changed since then (my name used to be Metaphor. When we server changed I was forced to change to Analogue). You can see that a lot of what I’ve got here is straight out of the box WoW. 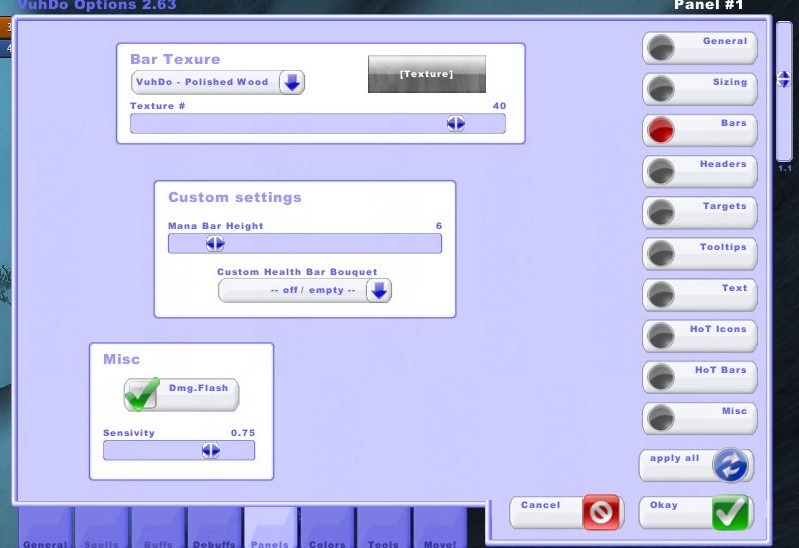 I’ve got the extra bars turn on and a couple addons in place. 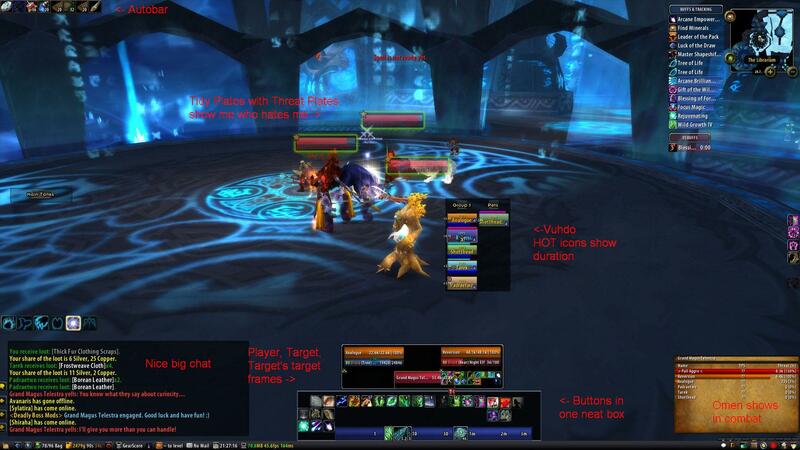 I actually did not use raid frames until after I was 80 – here’s the story. I was having fun at 80 healing 5 mans, even went into Naxx 10s sometimes. Did this for months. Then 3.2 dropped – Argent Tournament patch – and a member of my then-guild was complaining that he couldn’t heal any more because the patch had broken his raid frames. My first reaction was “Hah, see, I knew there was a reason I didn’t use those. He can’t heal any more without crutches”. My second reaction was – “Wait a minute, if they do that much, what am I missing?” So I took a whole day and played with raid frames. I’m the sort to research things thoroughly, so I learned that everyone seemed to use Grid or Healbot, both of which I’d heard of. I tried Grid first. 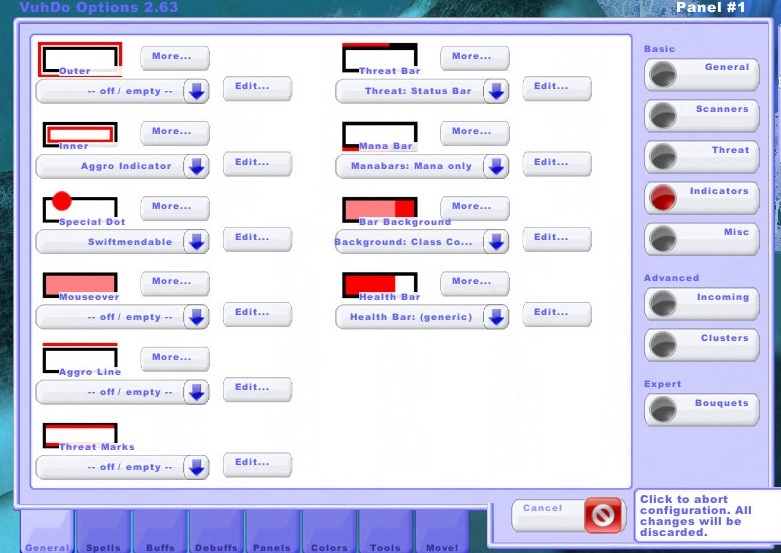 My main reaction was “how many addons do I have to download here?” It was about a dozen, I think. I tweaked for two hours and couldn’t get something I liked, so I tried Healbot. 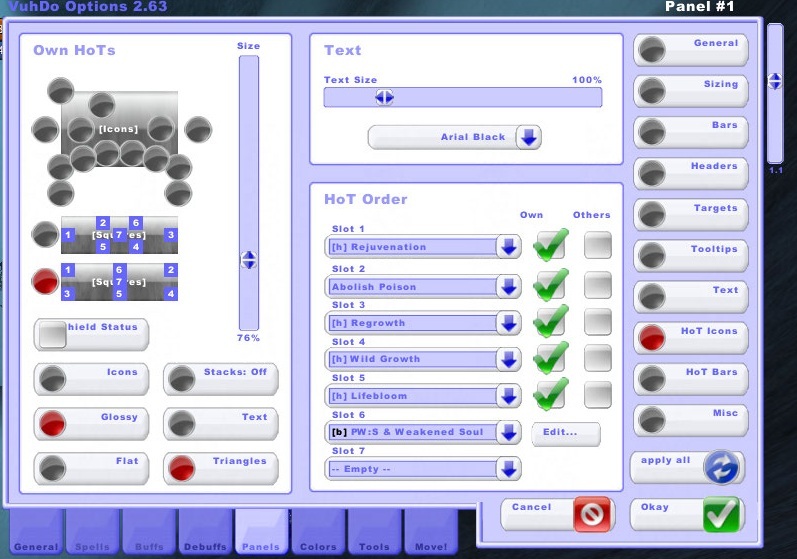 I pretty much hated Healbot right off – if Grid had too many options, Healbot didn’t have enough – so then I tried the addon with a weird name some people on plusheal.com were swearing by, Vuhdo, and like Goldilock’s taste of the little bear’s porridge, I thought it was ‘just right’. 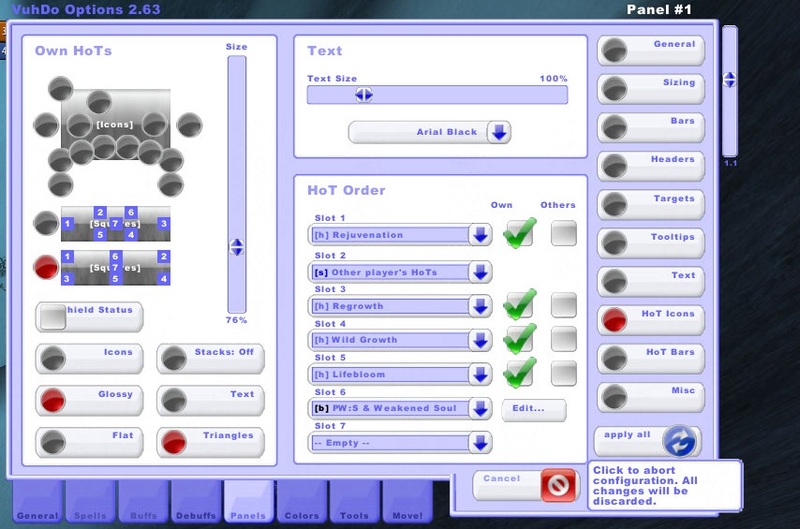 Now here’s my current UI, first in combat and then out. I personally think it’s a lot better than the previous ones. I’ve got my action bars grouped at the bottom, except one tiny sliver along the side. (The side bar has buffs and a downranked version of Rejuv that I use on stupid people occasionally, idiot hunters and such who pull aggro, won’t drop it, and whine about not getting heals). The bar with my profession skills disappears in combat, leaving me a solid view of the SexyCooldown bar (the big blue bar at the bottom). I’ve got my Vuhdo frames anchored just right of my character and my own and target frame just below me. This helps me keep an eye on what’s happening to me and around me as well as just the bars. I’ve set Recount and Omen to use the same spot on my screen. Recount shows out of combat, Omen shows in combat. It’s a nice trick to save space. Along the bottom I have ChocolateBar with various plugins that I don’t really need much – gold totals, clock, mail icon. 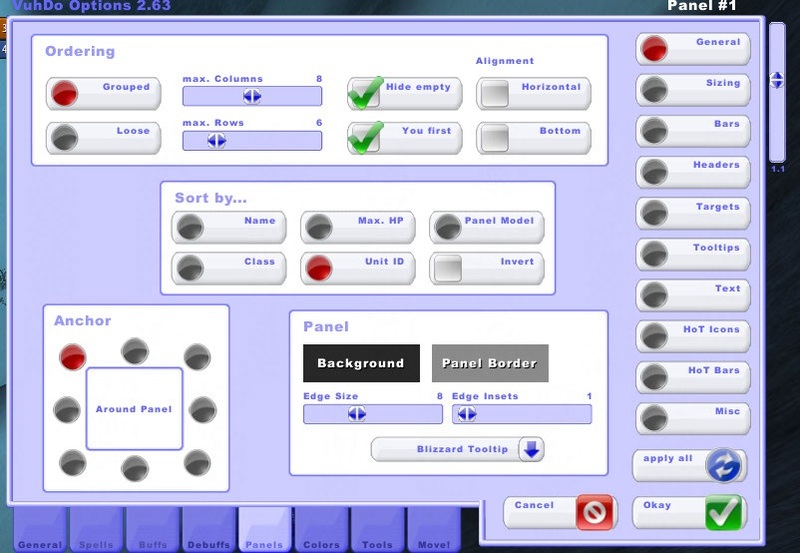 Bartender manages my button bars – I have one bar in the middle and on either side, another bar that I’ve arranged in 3×4 format. Personal preference there, nothing fascinating. As a druid, if I’m in a raid I’m supposed to be raid healing and that means being able to tell at a glance who has what HOTs and for how much longer. I’ve tweaked Vuhdo to show me exactly that. Each HOT has its assigned place on a health bar, and displays how many seconds it has left. Here’s a bigger version of a Vuhdo square so you can see it. Vuhdo has options to show other people’s hots too and I have it set to show me if another druid has something on a target that I can Swiftmend – the red dot icon in the corner of the unit frame says “Regrowth or Rejuv active on this target and Swiftmend is off cooldown”. The Lifebloom stack is really cool – when I have one stack up, it shows a red number of seconds remaining, when I have two stacks it’s yellow and when I have three stacks, it’s green. You may have noticed in my “in combat” shot that some of the Vuhdo bars showed little red >> << marks. That means someone has aggro from somewhere (sometimes it’s laggy but it’s pretty solid) and also a third small bar along the top of each player’s health bar showing a visual representation of how much aggro they’ve got. This, Omen, and TidyPlates are all tools I use to try to keep track of who is likely to take damage soon.If I can see that the mage has threat and is getting more all the time, I can maybe save him. 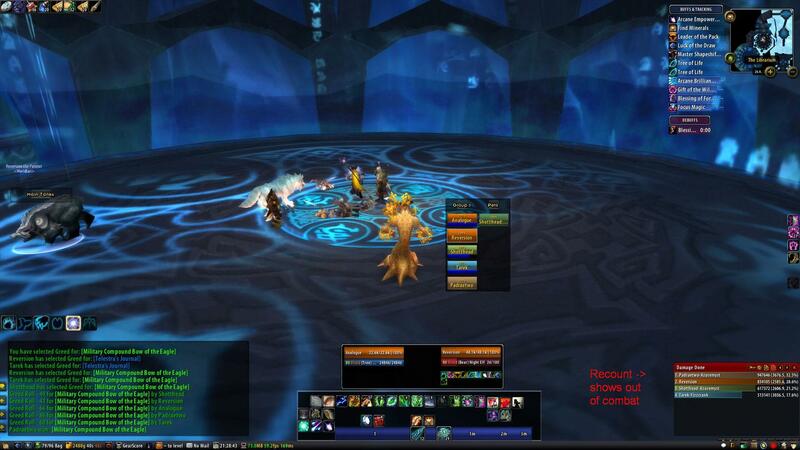 Finally here’s a screen shot of what Vuhdo looks like in this setup in a 25 man raid. 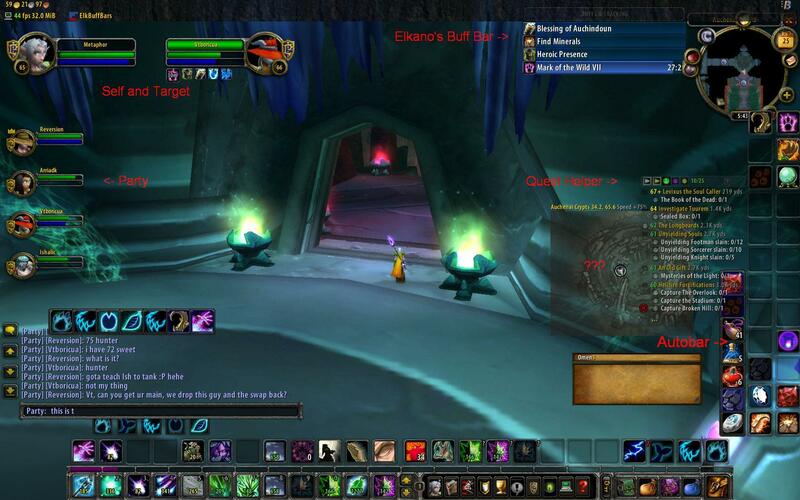 This is the “test” mode – those aren’t real people in a raid, I’m sitting in Ironforge by my lonesome. 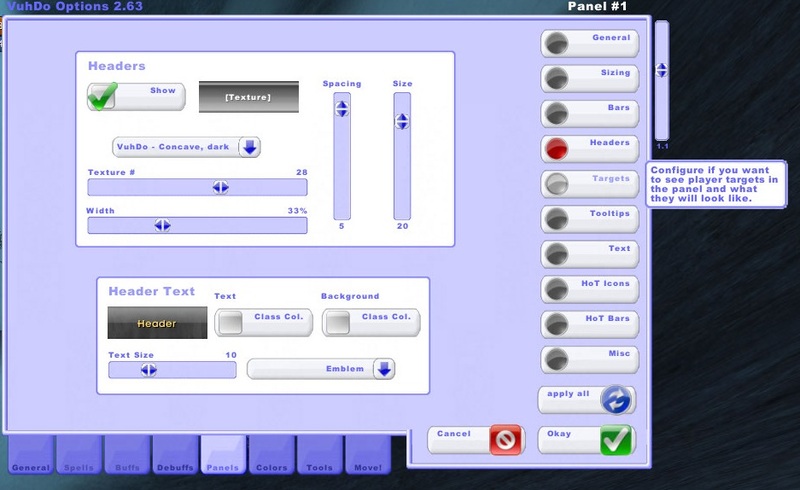 Vuhdo manual – And this forum has the creator of Vuhdo, Iza, as a very active participant! He’ll answer your questions if you can’t find them elsewhere. Look for the Vuhdo subforum off of the Mods & UI forum there. My takeaway for you would be, don’t settle for “ok” in your interface. Find what works for you. Keep tweaking until it shines. Try new things, get rid of what doesn’t work. Some people put their raid frames below their character, or to the left, or along the top. Figure out what helps you keep yourself and everyone else alive the most. Some people hide most of their abilities, others need everything on screen at once. 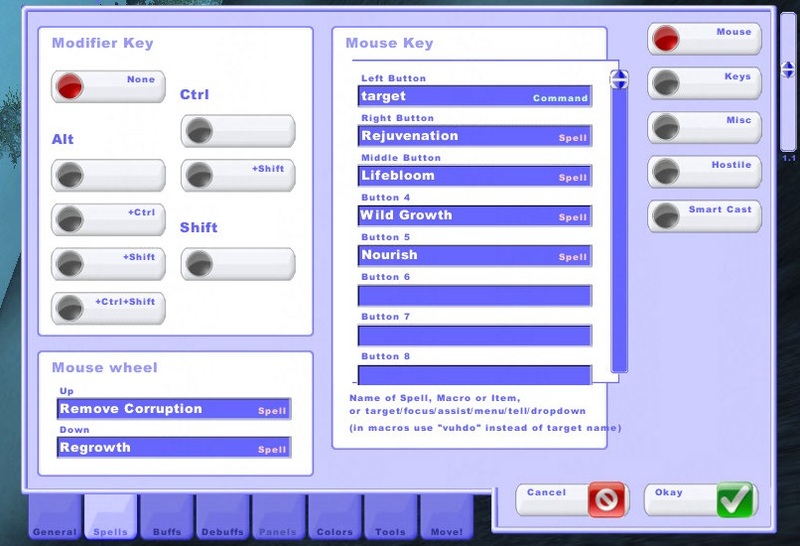 Look at other peoples’ ui screenshots – that PlusHeal forum I mentioned before has a long, long thread for just that – and copy the elements you like, ignore the ones you hate. There’s no one perfect setup for healing in WoW.